A new Smart Tweezers web site is launched in Taiwan. Smart Tweezers automatically remove offset allowing to measure small capacitance and resistance of 1 picofarad and 1 milliohm range. Newly released web site for Smart Tweezers LCR-meter presented by Siborg Systems Inc. introduces new instructional materials and useful user tips for the new model of a popular electronic LCR-meter in Chinese. Smart Tweezers LCR-meter manufactured in Canada is getting lately more and more popular in Taiwan, well known hub for electronics assembly. This fully-automatic digital LCR-meter makes highly accurate measurements by just touching any electrical component, for etither inductance (L), capacitance (C) or resistance (R). Smart Tweezers allow to automatically remove offset when measuring resistance or capacitance thus allowing to measure very small capacitance and resistance of 1 picofarad and 1 milliohm range. Unlike its recent clones, the original Smart Tweezers LCR-meter can measure not only resistance and capacitance but also inductance of a fraction of microhenry, making it an indispensable tool for use in radio electronics. "This web site will give our clients a better feeling of what this remarkable device would allow them to do," says Michael Obrecht, Director at Siborg Systems Inc. "Light weight and small size makes Smart Tweezers extremely useful for any kind of PCB work. 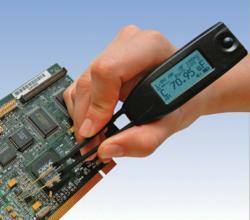 It is very important that Smart Tweezers is very user-friendly and intuitive. It virtually can be used without reading the Manual, it is almost fully automatic and gives you value of a component, whether it is L, C or R immediately when it is connected with the tweezer tips." Siborg Systems Inc. currently offers Introductory Sale Price for Smart Tweezers™ ST5.